About two bamboo carving artists in Ching Dynasty. Abstract: I introduce two newly-discovered chinese bamboo carvings with dates. One fixes the flourishing period of Shang-xun to 1797--1810s. Other backs the literary description of Chang-hsin. Since Chinese bamboo carving has been appreciated by literati class from 17th century, we can know many names of the artists as well as I-Hsin ware ceramics. 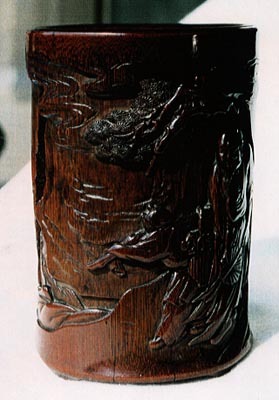 Many chinese decorative arts are anonymous, but some bamboo carvings and some I-Hsin wares have signatures of artists. To know the absolute date of a bamboo carver, we need enough believable samples with dates. And, reliable literal sources to back it. Jiading, near Shanghai, was a center of bamboo carving from late 16th century to 20th century. About artists in Jiading, we can reference the book "A record of Bamboo carvers" written in 1807.ref.4 Zhu-san-song(mid 17th century)( see http://www.npm.gov.tw) and Wu-zhi-fan(Kanxi period) are representatives in 17th century Jiading artists. This is an unpublished brushpot/brushholder by Wu-zhi-fan [fig.1], which has a cyclic year. This date should be 1695, because he was recorded in Kanxi period(1662-1722). 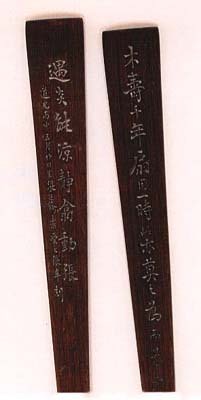 Ref.4 call Wu-zhi-fan a successor of Zhu-san-song and a clerk (about 1730s) recorded him. Both 1635 and 1755 are eliminated. But pre 19th century artists in other areas became unknown persons excluding some artists. Some authors would like to think the date 17th century(late Ming-early Ching) without evidence. Many talk "late Ming-early Ching" as sales-talk. It misleads understanding bamboo carvings. For example, Chang-chi-ho was often regarded "Bamboo Artist in Ming dynasty" without evidence. I can set him in Yong-gchen period (1723-1735). One hundred years ambiguity shows that dating them has not enough robust base. Several fine masterpieces have survived by liuqing or by relief. Shang-xun close-up figures in contrast with another liu-ching artist Chang-chi-Ho who likes distant views. Some critics feel more archaic. Faces of figures look strong personalities. liuqing technique: In working designs, removing the skin from the background area,and articulating the pictorial motifs in the skin that remains in the other areas. This [fig.2] is a armrest with liuqing technique. length: 21.5cm, wide: 6.3cm. Anonymous, late Quianlong style, early 19th century(?). I found an armrest with the date 1797 (fig.3; fig. 4; fig. 5),in personal collection in Tokyo. 25cm length. Relief. The inscription is [2th of Jiaquin,cyclic year is ding-si,Summer](10 characters are official script) ,[Shan-xun](two characters are seal-script). I think it genuine. Even if it were a copy, it is a direct copy of the original, because, former discussions esteemed his date 1600--1700. Both cases support the Date: 1797 should be reliable. This design depicts an immortal and a deer in ocean. A taoist subject in Ching dynasty. I can't find its iconographic source in taoist legends. 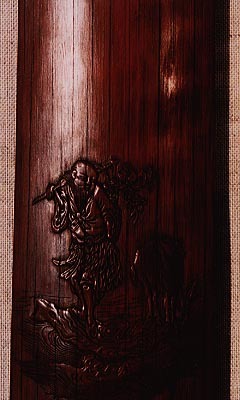 The figures likes the 2nd brush holder of the followings, but are carved not by liuqing but by relief. "Immortal and deer" (J ref.2.,ref.7 This has a cyclic year(1807 or 1747 or 1687 or 1627). New discovery demonstrated the 2nd Brushholder was made in 1807. I feel this 2nd brush holder should not be made in old age. The scene on 3rd brushholder is sparser than others. I feel this the later work.Therefore I set the flourishing date of Shang-xun 1797?--1810s. 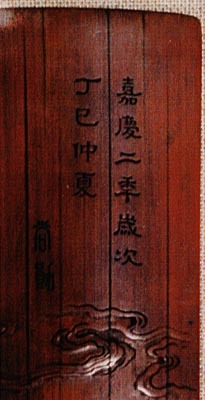 A famous scholar Chang Tin-ji was a patron of him and his uncle.